The species is widespread but locally distributed in England, mainly south of the Midlands. 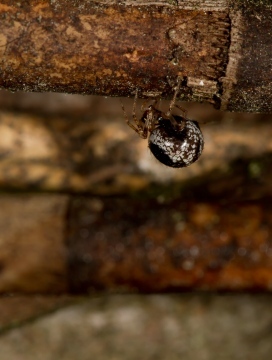 In Fenno-scandia it has only been recorded from Finland, but the spider is otherwise widespread in north-western and central Europe. This species builds its webs mainly in and around buildings, but also in grass tussocks and on other low plants and tree trunks in a variety of habitats. In Leicestershire the species occurs on walls and gravestones in and around churches and their churchyards, but has not been recorded from vegetation within the county (J. Daws, pers. comm.). Adults of both sexes have been recorded between May and July, but females may persist later. Daws (1999) suggests a short maturity season. Generally uncommon, although it has been found to be frequent in and around churches in Leicestershire (Daws 1999). Too little is known about the ecological requirements of this species to establish what threats it faces. More information on the ecology of this species is needed before management recommendations can be made.